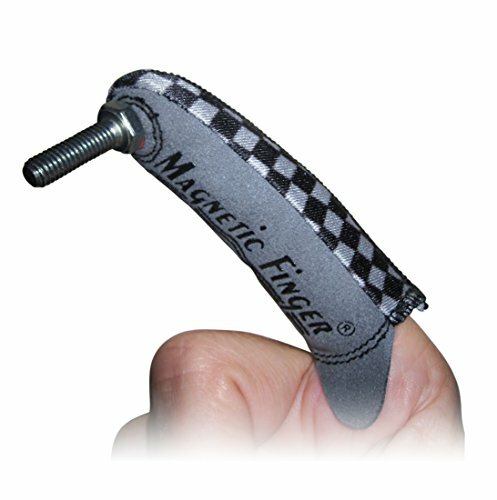 Magnetic Finger Tool - Moar Stuff - You don't need it but you know you want it. This Magnetic Finger Tool is another one of those items from the “why didn’t I think of this” file. This snug and stretchy glove slips on your finger and turns it into a professional tool. The powerful magnet at your fingertip allows you to hold and retrieve any small metal object with precise control. Use it to easily start a variety of fasteners in tight-fitting or difficult to reach places. It couldn’t be any more simple or useful. You should have one in your toolbox, garage, or junk drawer for all those times when small metal pieces have fallen just out of reach. Oh sure, you could get one of those telescopic magnetic sweeper tools to pick up screws and such that are out of reach. However, those tools won’t allow you to magnetically hold a nail or screw in place as you’re fishing for a hammer or screwdriver, will they? This simple finger-glove will. That makes it much more useful. Dimensions: 4.5 x 3 x 0.5 inches. Made of a stretchy material and a single, powerful magnet, this is a really handy item to keep in your toolbox.